IT leaders looking for flexibility and cost savings may be surprised to learn data protection has a role in both cloud migrations and IT modernization efforts. Combine the goals of your cloud data migration, IT modernization initiative and data protection plans and you can potentially move more data and run more applications in the cloud. You can create a cloud migration plan that includes automation and orchestration to speed moving applications, databases, virtual machines and more to the cloud. Consolidating multiple data protection products can mean risk reduction in downtime, data loss, recovery speed, and litigation support. Traditional scale-up architectures for secondary storage use a plethora of expensive, single purpose servers, storage and gateways for duties that range from media control to supporting services such as data protection, storage management, deduplication and encryption. Once a laggard, the healthcare industry – specifically healthcare providers - are now leveraging cloud computing more than ever. Healthcare providers are looking beyond private cloud deployments to hybrid and public cloud environments. This expanding usage is introducing new questions and challenges for today’s cloud stakeholders as they seek to manage and protect rapidly growing volumes of data. In this session, Janet King, Senior Director of Market Insights for HIMSS Media, will lead a discussion that draws on the latest HIMSS research to explore what the next wave of cloud migration will look like in healthcare. More specifically, as the healthcare cloud footprint grows and organizations move beyond private cloud to public and hybrid models, how are organizations moving, managing, and using data effectively across these environments? What the cloud footprint looks like for healthcare providers. How are workloads distributed across private, public and hybrid models? The common challenges faced by healthcare providers that are moving to the cloud. How are data protection challenges, compliance concerns, backup/recovery concerns impacting cloud decisions? The steps hospitals and health systems are taking to ensure the confidentiality, integrity and availability of data in the cloud. Appliances are part of our everyday life, especially in the home. They provide convenience and save us time and money. However, with their known and proven benefits, appliances are not widely used for data protection and management. Too often, organizations take a "Do-It-Yourself" approach with their backup and recovery solution, and waste time and money. If your backup and recovery solution has become too costly, complex, or just plain cumbersome, it is time switch and simplify your environment. Backup and recovery has become increasingly complex due to the continued exponential growth of data and the need to protect it across physical, virtual, endpoint, and cloud environments. In response, IT has implemented solutions to address each of these use cases. But what started out as a noble effort to protect data with ‘optimized’ solutions has morphed into a convoluted mess of point products, each with its own interface, capabilities, and hardware and software infrastructure. These data silos increase complexity and make recovery challenging. Bottom line, this is unsustainable. Whether the result of organic growth, M&A activity, or trying to solve specific use cases with targeted solutions, IT environments typically end up with a mix of single-function tools for backup, recovery and archiving, and usually from a range of vendors. Not only is this expensive, but it also significantly increases management complexity and makes it difficult, if not impossible, for IT to answer boardroom calls to extract more value from data and better safeguard that data in the face of stringent new compliance requirements. Proven practices for BCDR in healthcare. Make sure your organization is prepared. Do you know what your business would do if a natural or man-made disaster occurred? Business Continuity and Disaster Recovery (BCDR) typically isn't at the top of your list of priorities until something goes wrong. Yet it's more important than ever to be prepared, as the proliferation of data and information has created additional complexity for storage and record administration teams in healthcare. Many teams are particularly concerned about the detection and prevention of cyber-attacks and other criminal disasters. Find out how your healthcare organization can deploy modern, cost-effective data and cloud solutions with Microsoft. Hear about the BCDR approaches that other trusted healthcare institutions have employed and what they've learned along the way. Learn how Microsoft helps ease the burden of data recovery by providing management and enablement of scalable, more secure cloud solutions for healthcare customers worldwide. Cloud presents a big opportunity for Healthcare and Life Sciences organizations, but IT professionals are still learning how to best manage data across a hybrid environment. From a single platform, Commvault can help you manage, move and use data across files, applications, databases, hypervisors and the cloud. Commvault data management helps Healthcare and Life Sciences organizations administer, protect and access data across hybrid environments. Administer disparate systems in a single view, reducing costs while helping you manage an ever-increasing amount of information. In this webinar, you’ll learn how a major Healthcare organization is using integrated, reliable and secure cloud-based solutions from Commvault and Amazon Web Services (AWS) to help address significant data growth while reducing infrastructure costs. - Optimize data management for your organization. - Protect sensitive data from increasingly sophisticated cyber threats. - Reduce operational costs, even as data volumes increase. Companies raced to meet the May 2018 deadline to meet Europe’s General Data Protection Regulation with varying degrees of success, but if they learned anything since it is this: GDPR isn’t a one and done exercise. The GDPR might be the most eye-catching data privacy law on the books because of the outsized potential fine (up to 4% of revenue), but it is simply one of the first and most far-reaching such laws. Many more are emerging around the world and, indeed, in many US states. Some of the regulations overlap, while others conflict, meaning organizations face the ugly reality of having to deal with a patchwork quilt of laws. Enterprises and Service Providers are facing an increasing surge in data growth making managing and protecting data increasingly complex and costly. The addition of cloud locations as well as new requirements for security, compliance, and retention are creating additional complexities, further exacerbating management and cost challenges. Despite these challenges, you are expected to meet increasingly critical RPO and RTO requirements and ensure that the business can rapidly recover from any situation. Learn how Commvault and Cloudian have teamed up to offer a simple, easy-to-manage solution that is also cost-effective and scalable across multiple locations, including public cloud. Now you can simplify your data protection with policy-based management and new levels of technical and economic efficiencies. Your data protection and secondary storage solutions are stuck in the past. When they were first implemented, they were the norm, and maybe even leading edge. But times have changed, and so has technology and your business requirements. Yesterday's hot products are no longer able to keep up and support the modern enterprise. Whether you’re looking to get started in the cloud, defining your strategy or working to improve on your current cloud execution, the cloud can be complex. So how can you truly make your cloud strategy a reality? Harsha Sheshappa, Senior Engineer from Metro Trains Australia, shares key advice for addressing cloud data management challenges. He will provide an insight to their cloud journey and how they addressed key business challenges, while delivering practical advice you can use now. How will the cloud add value? What data should you move to the cloud? How do you keep data secure when migrating? How do you maintain control over all your data, on-premise and in the cloud? Today, most organizations already have a practical understanding of how to manage their data center. However, they often overlook or decide not to focus on data that resides on endpoints, and walk out the door on a nightly basis. This session will discuss the business drivers and technical challenges associated with protecting, managing and controlling data that lives on their edge devices – endpoints. We will help you the answer the question : Isn’t using a cloud file-sharing service good enough? Many companies today are considering how to replace their data backup and recovery software. And with good reason. Data volumes continue growing exponentially, organizations are digitizing more functions than ever, and most companies are implementing some form of hybrid cloud strategy that combines public cloud, private cloud, and traditional IT. Legacy and point solutions for storing, backing up and recovering data are not sufficient. And in a world where malware and ransomware attacks are rising, no company wants to be caught without backups. In this webinar, we’ll discuss the factors driving companies to reconsider their backup and recovery solutions and recommend five questions to ask when choosing a new solution. You need a modern solution that will scale easily, is cost effective and is simple to operate. You own Commvault and we understand it is not your only option. 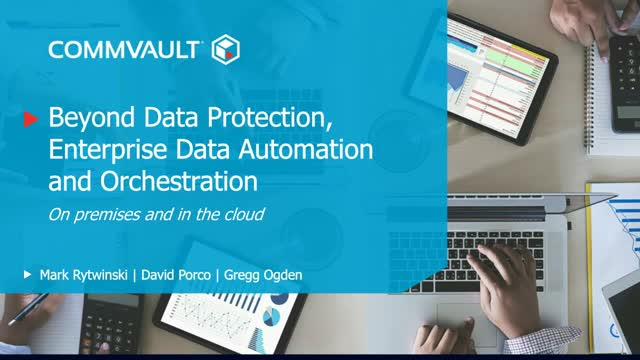 Commvault now delivers the power and simplicity of its data protection software on a scale-out infrastructure to provide greater scale, performance, and availability. Join us as we discuss how you can extend the benefits of our software through Commvault HyperScale™ Technology. Now is the time to modernize backup/recovery and unlock the benefits of a scale-out infrastructure. Register today and learn how Commvault software can take you to the next level of data protection. Register for one of our free webinars today for technology deep dives and to learn how to solve the challenges of your modern data center.